Polymers - Combination of similar monomers The word "Polymer" is generated from the Greek words "Polys + Meris" (English: Many + Parts). The multitude fields of biochemistry, medicine, and molecular biology have been profoundly influenced by discoveries in polymer chemistry. In exploring the relationship between the three-dimensional structures of biomolecules and their incredible biological function, biochemists have elucidated how nerve impulses travel with incredible speed, how enzymes accurately catalyze biological reactions, and the molecular mechanisms underlying many diseases. An understanding of polymers helped elucidate how DNA and RNA molecules store and transmit genetic information and direct the synthesis of proteins- the body building blocks! The understanding of the structure and molecular function of proteins stands as one of the greatest achievements of modern science and is still a highly active area of research. In this topic, we shall briefly consider the structure and function of polymers. Simple organic molecules are likely to be produced from elements such as carbon, oxygen, hydrogen and nitrogen present in earth’s atmosphere under the influence of ultraviolet radiations of sun and lighting discharges. When these small organic molecules are joined together, "giant" molecules are produced. These giant molecules are known as macromolecules. Macromolecules are polymers (from the Greek polys - many, and meris - part). For example: The large molecules of carbohydrates (starch), proteins (Hemoglobin) and nucleic acids (DNA and RNA) are polymers. For example, Polymers are large molecules of many similar "units" linked together by covalent bonds. The repeating units that serve as the building blocks of a polymer are small molecules called monomers. DNA polymer is formed from nucleic acid monomers. Human DNA is a polymer with over 20 billion constituent atoms. Protein polymer is formed from amino acid monomers. 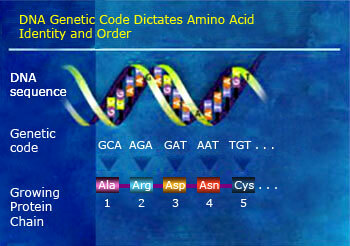 Proteins are built from 20 kinds of amino acids arranged in chains that are typically hundreds of amino acids long. DNA is a polymer made up of nucleotides The monomer units of DNA are nucleotides, and the polymer is known as a "polynucleotide. The simple organic molecules like HCN, HCHO combine further to generate small organic molecules like amino acids, nucleotides, sugars and proteins which are found in cells. These substances further form complex sugars, nucleic acids, etc, through polymerization. Polymers are produced from monomers and are random in chain length and composition. These influence the formation of other polymers. The advantage of polymers is that an infinite diversity of structures can be produced with a limited number of starting materials (monomers); a modular construction allows for ease in recycling the monomers; when a particular polymer is no longer needed its monomers can be used to build other polymers and for transport since polymers are large and not easy/possible to move around. Thus, monomers can be readily transported to the sites where the polymers are constructed. For example; DNA is a polymer. The monomer units of DNA are nucleotides, and the polymer is known as a "polynucleotide." Each nucleotide consists of a 5-carbon sugar (deoxyribose), a nitrogen containing base attached to the sugar, and a phosphate group. There are four different types of nucleotides found in DNA - Adenine (A), Thymine (T), Guanine (G) and Cytosine (C) . A polymer DNA is processed to form protein Polymers are a large class of materials consisting of many small molecules (called monomers) that can be linked together to form long chains. The biosynthesis of the polymer is of central importance in life. It is responsible for the transformation and accuracy of molecular structures and function that are stored in the genes and passed down from generation to generation of any given organism. The inheritance of structure and the accuracy of the process of polymer synthesis in the cell is absolutely important for the propagation of life and this process is the basis of Darwinian evolution. 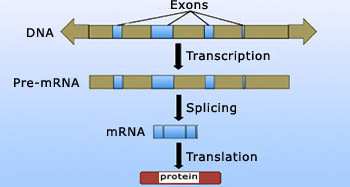 Being central to all life forms, the molecular components of transcription (DNA to RNA synthesis) and translation (protein biosynthesis using a mRNA template) are amongst the most conserved proteins among all organisms. While there is variation among the types of polymers found in different organisms, the chemical mechanisms by which cells assemble and disassemble polymers are largely the same across organisms, even if the polymeric macromolecules differ in the nature of their monomers. Dehydration Synthesis of a polymer The monomers of organic compounds join together by a chemical reaction know as dehydration synthesis to make polymers. Monomers are molecules typically about 4−10 atoms in size, reactive in that they bond readily to other monomers in a process called polymerization. Polymers and their polymerization processes are so diverse that a variety of different systems exist to classify them. One of the major type from them is condensation polymerization, where reacting molecules release water as a by product. This is the means by which all proteins are formed. Monomers are linked together through a process in which two molecules are covalently bonded to each other through loss of a water molecule; this is called Dehydration Synthesis(condensation reaction), because the molecule lost is water. 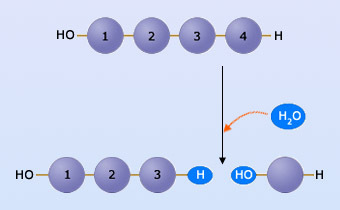 When a bond forms between two monomers, each monomer contributes part of the water molecule that is lost: One molecule provides a hydroxyl group (−OH), while the other provides a hydrogen (−H).In making a polymer, this reaction is repeated as monomers are added to the chain one by one. The cell must expend energy to carry out these dehydration reactions, and the process occurs only with the help of enzymes (specialized proteins that speed up chemical reactions in the cells). 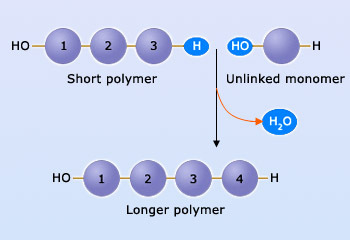 Polymer hydrolysis results in monomers Hydrolysis means the splitting of a compound into two parts with the addition of the elements of water. Polymers are disassembled to monomers by hydrolysis, a process that is essentially the reverse of the dehydration synthesis. Hydrolysis means the splitting of a compound into two parts with the addition of the elements of water. Bonds between monomers are broken by the addition of water molecule - a hydrogen from the water attaching to one monomer and a hydroxyl group attaching to the adjacent monomer. The process of digestion is an example of hydrolysis taking place in our bodies. The organic material in our food is in the form of polymers that are much too large to enter our cells. Within the digestive tract, various enzymes attack the polymers, speeding up hydrolysis. The released monomers are then absorbed into the bloodstream for distribution to all our body cells. Those cells can then use dehydration reactions to assemble the monomers into new polymers that differ from the ones that were digested. The new polymers perform specific functions required by the cell. 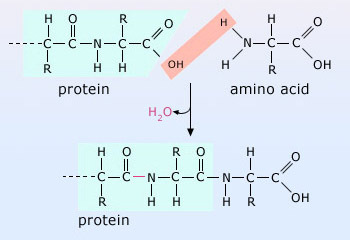 Amino acids ordered into unique proteins Organic polymers include DNA, RNA and proteins. These organic polymers contribute to biological diversity by being different in the various organisms in the ecosystem. The variation in the form of macromolecules is largely responsible for molecular diversity. Much of the variation that occurs both within an organism and among organisms can ultimately be traced to differences in macromolecules. Macromolecules can vary from cell to cell in the same organism as well as from one species to the next. The inherent differences between human siblings reflect variations in polymers, particularly DNA and proteins. The diversity of macromolecules in the living world is vast, and the possible variety is effectively limitless. What is the basis for such diversity in life's polymers? Generally speaking, all macromolecules are produced from a small set of about 50 monomers and some others that occur rarely. Different macromolecules vary because of the arrangement of these monomers. By varying the sequence, an incredibly large variety of macromolecules can be produced. The molecular logic of life is simple but elegant: Small molecules common to all organisms are ordered into unique macromolecules.